My grandfather never married my grandmother for a very good reason: he was already married. That didn’t keep him from taking a mistress (my grandmother) and getting her pregnant (my father). And neither wife nor mistress kept him from abandoning them both and sailing off to Shanghai. I think I was about thirteen when I first heard this story, and I was curious, as all little boys are, and a little bit in awe of hearing such unusual things about what I had thought was a very quiet and normal family. Anything but, it seemed. Now that I have seen Shanghai, I think I have a better understanding of what that all meant. But I am getting ahead of myself. My father was born –out of wedlock – in 1917. There was a war going on at the time, so it can’t have been easy getting medical attention, I don’t imagine. And giving birth when you are not married was definitely frowned upon in those days. I don’t know what shame that birth brought upon my grandmother’s head, but it was enough to drive her to undertake a perilous adventure. My grandfather was in construction, and after the war England was not an easy place to get work. The war had caused a lot of economic damage in Britain, as wars do, and the prospects for employment looked better overseas, particularly in China, and most particularly in Shanghai. Shanghai was at that time a British colony, and Britain intended to make it into its primary port and mercantile hub for the Empire in Asia. Buildings were going up at a phenomenal rate, and my grandfather sailed to Shanghai, as many young men did after the Great War, to find work and his fortune. 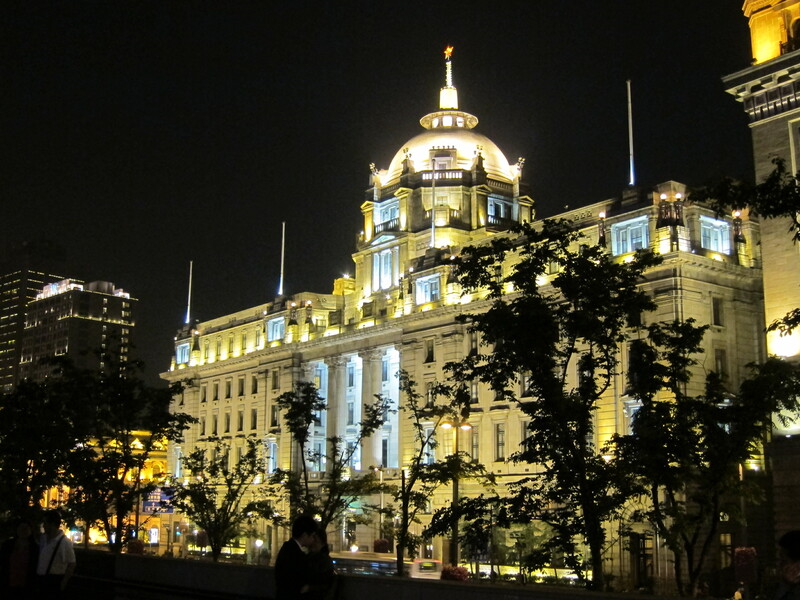 As far as I can tell he first went to work on the Chinese Mercantile Bank on Nanjing Road, with its famous gold leaf dome, completed in 1921. I also believe he worked on the Hongkong and Shanghai Bank (HSBC) on the Bund overlooking the Huangpu River, famous for its dome mosaics, and completed in 1925 (The mosaics were covered up when the Communists took control and survived the ransacking of “imperialist” heritage buildings. I was unable to ascertain whether the magnificent dome of this building was also originally graced with gold leaf and stripped by Mao for his coffers). Certainly there was no shortage of building going on. At any rate my grandmother, having waited some time for her man to return, decided to take her young son, who can have been no more than five or six at the time, and sail to Shanghai to find his father. I can’t imagine what she must have thought when she landed. There would have been a dizzying array of sights and sounds to greet her, for Shanghai was alive with Germans, French, Russians, Brits, and of course Chinese all building and buying, selling and drinking, gambling and dealing in drugs, for the heart of the opium trade ran through Shanghai. How she coped with all that, I don’t know. How she found my grandfather in all that, I have no idea. But find him she did and I can only imagine how desperately she pleaded with him to ‘make an honest woman’ of her, and accept this young child by her side as his son and return to England with her. He refused; apparently he was by now already ‘married’ to a local woman, and had no intention of accepting any responsibility for any children or of returning to England. How did she bear that, the poor woman? Having given her all to this man, having been willing to be disgraced for the sake of his love, having borne his child and brought it to him in China, to be refused in such circumstances, how did she bear such callous rejection, how did she bear such grief? And what must my father have felt, so have come so far with the prospect of seeing his father, to have been told to behave in such a way; to say such and such things, to smile and be polite? Did he think it was his fault, his father’s rejection? What did that do to his young heart? I can only imagine. But I have seen Shanghai, its stately buildings, its wealth of colour and life, its clash of East and West, its crush of people, and it must have been then a disorienting experience for both mother and child to be alone is such place under such circumstances. Somehow my grandmother made it to Vladivostok in Russia where the two of them made the long and lonely journey back to Europe on the Trans Siberian Railroad. My grandmother died a few years later, perhaps of a broken heart. My father became an orphan with her death, having never been acknowledged by his father. I don’t know what that did to my father emotionally, for we never talked of such things. He was always a very private man, my father, with private griefs that he bore with gentlemanly grace. He was always most kind with me, and I liked being in his quiet presence as he worked on his trains and painstakingly carved wooden boats. Perhaps someday, if God has answered my most fervent prayer, I will have the joy of walking and talking with him again in Heaven, where no one is an orphan, and all griefs are gone. This is my most fervent prayer.